Conscience is the inner voice that tells one right from wrong. Law is defined as a rule of action recognized as binding and enforced by a national authority. What happens when the two conflict? To which do we owe the greater allegiance? The answer to these questions lies within the great American models of civil resistance in speech, and deeds. To what extent should we resist, and how much must we sacrifice for the sake of freedom? And what is the relationship between individual enlightenment and political freedom? Through the works of various philosophers, reformers, and fictional characters, I will show that critical thinking, the study of principles, and a willingness to sacrifice personal security are necessary for political freedom to exist. Individual enlightenment is, therefore, essential for freedom of thought and necessary for genuine freedom from the tyranny of the majority. Immanuel Kant stresses the importance of individual enlightenment. In his essay, “What Is Enlightenment,” Kant argues that opinions matter, and that the freedom of speech, or the ability to express them, effects society as a whole. The public use of one’s reason is different from the private use because in the private sphere, one may have a certain role to play, a particular job or function, where following rules and acknowledging a hierarchy of command is necessary. In the public sphere, however, these individual roles no longer exist or matter, and all are equal and may be called to act as “scholars.” In this equality, no citizen is constrained by dogma, and even law can be questioned or challenged. It is noteworthy that Kant uses of the word “scholar” to describe individuals in the public sphere as opposed to “citizens”. A scholar has different duties from those of the private citizen. Where the private citizen pays his taxes, the public scholar may question a particular tax, and the latter writes to awaken his fellow citizens to the injustice and to influence the authorities by way of his complaint. Additionally, Kant advocates gradualism and he warns against using revolution as a means of achieving lasting changes. The argument that “a revolution may well bring about a falling off of personal despotism and of avaricious or tyrannical oppression, but never a true reform in one’s way of thinking” cautions against the effectiveness of revolution. Kant is skeptical due to the upheaval that revolutions and wars can cause. It is evident that, as Kant asserts, enlightenment occurs only gradually, as the result of critical and imaginative thinking expressed in a public forum. Henry David Thoreau, a transcendentalist, naturalist, and abolitionist raises the most important point of all with our responsibility to enact freedom and to influence the government to amend unjust laws. As Thoreau explains, in his Civil Disobedience, “unjust laws exist” and he goes on to question our obligation to obey unjust laws, “shall we be content to obey them, or shall we endeavor to amend them, and obey them until we have succeeded, or shall we transgress them at once?” In the context, the question is a rhetorical strategy; he means to underline the madness of consenting to unjust laws. If a law may be as so flawed, then “under the name of order and civil government, [the American government] we are all made to last pay homage to and support our own meanness.” It is evident Thoreau implies a “self-reliant” obligation to hold our own moral law above the laws of state. In that manner, we rely on our conscience and critical thinking skills. In such cases we must defer to our conscience and rely upon our critical thinking skills. So, it is just to say that Thoreau’s idea to distrust the government is part of our obligation to freedom. In accordance with Reverend Martin Luther King, an abolitionist and individualist, a law that is not just, or does not follow a moral code, is not a law at all. Thus, an obligation to moral conduct and the laws of state jointly rule us. In this way, ideally the citizen and the state work together to maintain order as well as to protect the freedom of all. It has often been questioned whether there is a need for government interference in our daily lives, and if there is a need for government at all. This, again, pertains to the definition of freedom and how it is realized. What are we willing to sacrifice? The solution that anarchy poses to a society where corruption breeds in the minds of supposedly innocent men, women, and children is probably not a solution at all. A violent society, like the one that plagues certain American cities and that we have unintentionally created, not only needs government, but it needs one that can impact our daily lives. It is not whether government should exist or not, but how much we should let it influence us, and how much we should influence it. Thus, our responsibility as citizens, in order to protect a space for the appearance of freedom, is to work together with the government, to never let it obtain too much power, and most importantly to question it. As Martin Luther King Jr. explained in his Letter From A Birmingham Jail, that although we must follow laws as he “urge[d] people to obey the supreme court’s decision of 1954 outlawing segregation in public schools” , we must also be precautious to ensure conscience plays role in law. That is when we spurge in realization. It is not about whether or not we need sacrifice, but rather how much must we sacrifice and what we must sacrifice. 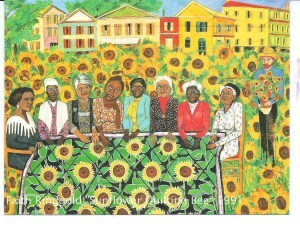 These African American women freedom fighters who blazed a fearless trail through American history that Coretta Scott King, Sojourner Truth, Mary McLeod Bethune, Harriet Tubman, and Rosa Parks hold the edges of an outspread quilt pieced with more sunflowers. Their expressions are pensive and only a few look directly at the audience. The myriad of skin color among the women from a ebony, charcoal, sienna, cinnamon, and even peach, is used to highlight the spectrum of hues in the flowers. Ringgold has likened the sunflowers in this work to African Americans in solidarity: united, tall, strong and turning their faces to follow the sun. The true essence of freedom relies on an individual’s ability to surpass herself or himself, even to act against his inclinationsThis defiance of his own needs and desires and to sacrifice prejudice is a form a freedom itself. Freedom assumes a capacity for sacrifice. Freedom is not about having or attaining. Ultimately, it is about being able to give up whatever it is we have for the sake of something more, ultimately public freedom and imaginative thought. In the movie, 12 Years a Slave, the protagonist, Solomon Northup is a middle-class New Yorker, living like an average family man. In the 1840s, however, he is kidnapped and sold into slavery. Through a serious of human torture and human trafficking, Northup survives. But, he is sold to the brutal Edwin Epps, who makes slavery a perpetual nightmare. Eventually, Northup meets a Canadian carpenter, a white man named Bass who is outspoken in his criticism of slavery. The audience first witnesses his passionate beliefs when Epps offers Bass a drink and comments that he must be thirsty; Bass counters that he should be more concerned with the condition of his slaves. It is a fact—a plain and simple fact—that what is true is true and right, white or black alike. This unlike what Epps is used to. For example, Epps quotes Scripture too, taking Luke 12 out of context and threatening slaves that if they fail to do their master’s will, and they “shall be beaten with many stripes.” But his “faith” is more superstition than true Christianity. In contrast, after Northup and a group of other slaves are purchased by Epps, his cotton harvest dips badly. Epps describes it as a “biblical plague” and attributes it to the new slaves. He sends them to work for another plantation owner until his crops recover. Bass, meanwhile, labels slavery “unrighteous” and says that there’s no justice in it. He insists that there will be a day of reckoning for slave owners. Unlike the rest of the characters in the movie 12 Years a Slave, Bass is inspired by values of ethics and justice. He must sacrifice his own safety in order uphold his beliefs and prove himself worthy of imaginative freedom for a larger cause. Bass is at risk; the film doesn’t explicitly tell us, but Bass fears repercussion for himself as well as Northup. Yet nonetheless, inspired by the principles of justice, equality and solidarity, he agrees to mail the letter. After a lengthy delay that causes Northup to despair of ever being rescued, he is found and liberated by Henry B. Northup, a member of the same white family that his father had served years before. The spiritual practice of shadow encourages us to recognize and deal with those parts of ourselves that we find to be despicable, unworthy, and embarrassing — our anger, jealousy, pride, selfishness, violence, and other “evil deeds.” Shadow work is essential for the soul health of both individuals and communities. 12 Years a Slave can catalyze this important spiritual work. It compels us to confront the toxins of racism that have been so prevalent in our psyches and in our history. Once again, the film manages to provide a moral upheaval and demonstration of sacrifice as a necessity for freedom. Katniss overcomes lethal competitors and manipulation of the Games to become a symbol of hope for freedom to an otherwise despairing public. She believes that they, too, can fight for liberty and prevail. Human freedom is expressed through the personal choices and small decisions we make in our everyday lives. The contestants are expected to kill each other without mercy; but Katniss hides, simply trying to survive without attacking others. Katniss and Peeta, her fellow tribute from District 12, work together to stay hidden and alive. Having grown so close in friendship during the Games, Katniss and Peeta cannot bring themselves to kill each other when they find themselves to be the last remaining contestants. The name “Panem” is derived from the Latin phrase for “bread and circuses.” The ancient Roman saying refers to the practice of government buying the support (and votes) of citizens by offering spectacular―and cruelly violent―forms of entertainment and free grain, lulling citizens into relinquishing their decision making powers. This is why individual freedom, when realized, is crucial before demanding social freedom. 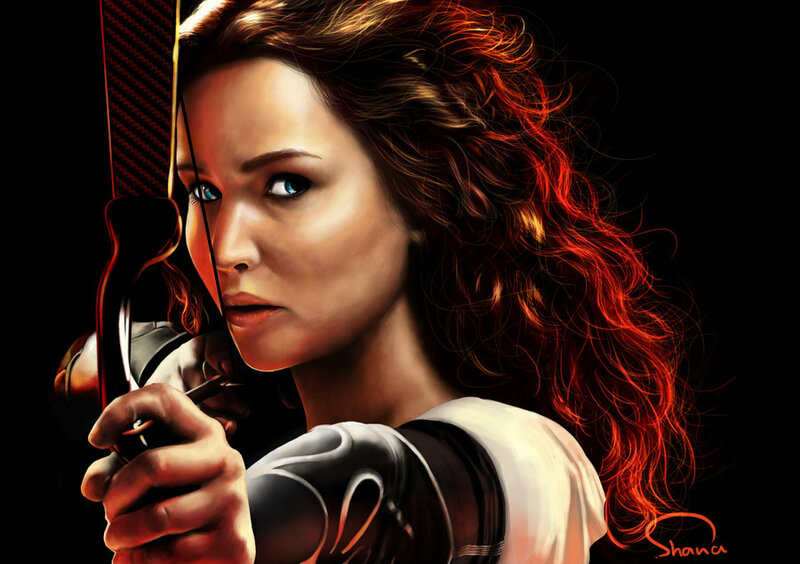 In a society where rules and oppression define the lives of its citizens, the fictional Katniss shows that freedom is not completely lost, despite the external constraints on her. She still has the will to make choices based on what she believes to be right and wrong, often in defiance of the expectations of her government. Even in the darkest of circumstances, personal choice and liberty can prevail if only we do not cave in to the immoral expectations of our leaders and peers. We have a certain obligations to help humanity, for we are part of it, and how one person is affected, it affects us all. If we do not make an effort to be part of society, we will not reach sense of imaginative thinking in the public forum. John Donne believes that “no man is an island, entire to itself; every man is a piece of that continent, a part of the main.” Therefore, without that piece, it would be useless. We are powerful together, so, it is only reasonable we should help anyone in need of our help. We should not see this as an individual obligation to humanity, but and an essential moral conduct of life. We are endowed with certain responsibility to sacrifice and depend on our conscience and imaginative thought and freedom. When we are a part of a congregation, be it the government, society, or humanity, or even all three, it is not an obligation to sacrifice and seek individual enlightenment. It is a necessity for freedom and to live, simply to live. If you do not fulfill these “obligations” then, it is unfortunate to say, but you are not living. It is a matter of being at peace with your mind, your actions, and your people. Our right to think and act according to our conscience is a privilege compared to others. Together, if done with passion, we can accomplish the true realization of individual enlightenment and sacrifice to realize the heights of public freedom. 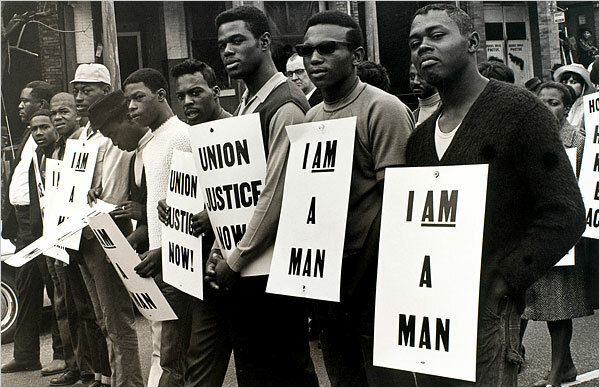 Builder Levy’s photo of marchers in Memphis in 1968. Browdy de Hernandez, Jennifer, et al. Women Writing Resistance : Essays On Latin America and the Caribbean. Cambridge, Massachusetts: South End Press, 2003. Donne, John, and Robin Hugh A Robbins. The Poems of John Donne. 1. ed. Harlow, England: Pearson/Longman, 2008. Echols, James. I Have a Dream : Martin Luther King Jr. and the Future of Multicultural America. Minneapolis: Fortress Press, 2004. Kant, Immanuel. Foundations of the Metaphysics of Morals And, What Is Enlightenment. 2nd ed., rev. New York: Macmillan , 1990. King, “I’ve Been to the Mountaintop,” in A Call to Conscience, eds. Carson and Shepard, 2001. King, Martin Luther. Letter From Birmingham Jail.Stamford, Connecticut: The Overbrook Press, 1968. Ross, Gary, et al. The Hunger Games. [2 disc dvd + digital copy] Santa Monica, Calif.: Lions Gate Home Entertainment, 2012. Sacks, Kenneth. Emerson : Political Writings. Cambridge, UK: Cambridge University Press, 2008. Thoreau, Henry David. Civil Disobedience. Harrington Park, N.J.: The 5 x 8 Press, 1942. King, Martin Luther. Letter From Birmingham Jail.Stamford, Connecticut: The Overbrook Press, 1968. you need page numbers for every reference!